North Carolina strawberries just came into season and Brandon sweetly picked up a flat for me at the farmer’s market last week. 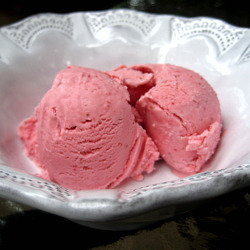 Strawberry is my favorite flavor of ice cream and ever since I received the KitchenAid ice cream maker attachment last Christmas, I’ve enjoyed trying homemade ice cream recipes. I was thrilled to see that Gourmet had several no-cook strawberry ice cream recipes. We had friends in town visiting last weekend and I thought this Strawberry Cheesecake Ice Cream would be the perfect dessert for our cookout Friday night. It was so easy to put together since it didn’t require any cooking. You just throw all the ingredients in a blender then into the ice cream maker to freeze. I made it on my lunch break the day I served it. Not surprisingly, the ice cream was a hit. Who doesn’t love homemade ice cream? 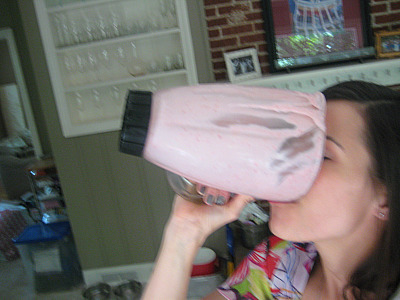 Place strawberries, cream cheese, sugar, milk, lemon juice and salt in a blender. Blend until just incorporated. Stir in the heavy cream and chill. Follow the directions on your ice cream maker to freeze ice cream. For the KitchenAid I slowly added the chilled ice cream base and mixed on the lowest speed for about 15 minutes, until the ice cream was the consistency of soft serve. Place in an airtight container and put in freezer to freeze completely. Note, you may want to take the ice cream out to soften 10-15 minutes before serving. And I can’t resist sharing this picture that shows you how good the ice cream base tasted but I won’t reveal how much unfrozen ice cream I ate! With a fridge full of fresh cherries and strawberries, I found myself wanting to make a batch of muffins. I was looking for a very simple recipe where I could just stir in the chopped cherries and strawberries into the batter. I scoured the Internet for recipes and the only one that truly appealed to me was this recipe I saw on a blog I’m unfamiliar with, Cucina Nicolina. I made six strawberry and six cherry muffins (I just divided the batter at the end). The muffins were exactly what I was looking for. I really enjoyed the texture and appreciated that they weren’t overly sweetened. The flavor of the fruit was the star. Muffins are the perfect on the go breakfast. I usually just stash them in the freezer and grab one on my way out to work. These have been a welcome change to the banana muffins that I’m typically stocked with. Preheat oven to 375 degrees. Prepare muffin pan with cooking spray or liners. Whisk together flour, baking powder, salt and cinnamon. In a separate bowl, mix together egg, vegetable oil, sugar and milk. Make a hole in the dry ingredients and pour in wet ingredients. Mix together until just combined. Do not overmix. Batter should still be fairly lumpy. Stir in chopped fruit (if you’re doing a combination, you will want to divide the batter first). Fill muffin tins about two-thirds full. Bake for 20-25 minutes, until golden in color. Our friends Cristen and Graham just welcomed a beautiful baby girl into this world. After a couple weeks at home adjusting to the crazy life of being new parents, they were ready to get out of the house! We invited them over for a casual evening with make your own pizza. I put together some fun toppings and everyone made their own pizza. I think it was just the thing they needed to relax a bit. Baby Camille was on her best behavior and slept pretty much the whole time. We hardly heard a peep. I wanted to make a lighter dessert that would be nice after pizza. I knew Cristen loved lemon-flavored desserts and I’d had my eye on some strawberry tart recipes for the last month or so. I decided to combine the two and it worked out perfectly. I think my favorite part of this dessert was the crust. It was so good! It is definitely going to become my standard sweet tart dough recipe. If I made this again I would probably make an extra half batch of the lemon curd to fill the tart pan a little more. Don’t be intimidated by all of the steps. It’s really easy to put together if you make the curd and crust the night before you want to serve it. Fit a stand mixer with the paddle attachment. Stir together flour, sugar and salt in mixer bowl. Add the butter and beat on medium-low speed until the texture resembles coarse cornmeal (should be between the size of oatmeal flakes and peas). Add the egg and beat just until the dough pulls together. Transfer the dough to a work surface and gently pat into a ball. Lightly flatten into a disk shape. Roll our immediately or wrap in plastic wrap and chill for 1-2 hours. When you’re ready to roll the dough, butter a 9-inch tart pan with removable bottom. Roll the chilled dough on work surface to form a 12 inch round. You’ll want to free the dough from the work surface occasionally to make sure it’s not sticking. You can also use a bit of flour on your roller and work surface to help with sticking. Turn dough into prepared tart pan. Seal any cracks that you may have. Trim your overhang to about 1/2 an inch. Fold the overhang in to create double thick sides. Pierce crust all over with a fork. Freeze the crust for at least 30 minutes (I froze mine overnight) before baking. You need to bake your crust before filling. Preheat oven to 375 degrees. Remove dough from freezer and cover with nonstick foil, shiny side down. Bake for 20-25 minutes. Remove foil and bake for an extra 10 minutes, or until golden brown. Cool crust on wire rack to room temperature. Whisk eggs, sugar and lemon juice in heavy small saucepan. Add butter and lemon peel. Stir over medium heat until curd thickens to pudding consistency, about 8 minutes. Transfer to small bowl. Press plastic wrap onto surface of curd and chill at least 2 hours. Spread curd in crust. Layer strawberries over curd. Heat jam in a small saucepan or in a small bowl in microwave. If you microwave – BE CAREFUL! The jam gets hot VERY quickly (ask my husband about the second degree strawberry jam burn all over my hand – ouch). I recommend microwaving for 5 seconds at a time until it thins to desired consistency. Brush jam over the top of strawberries and let glaze set in refrigerator for at least one hour or up to six hours. Release tart from pan and serve. My grandmother’s birthday was yesterday (HAPPY BIRTHDAY MEMA!) and I wanted to send her a package with some goodies. She has loved scones ever since I made them for a brunch when I graduated from college. Since strawberries are in season, I decided that fresh strawberry scones would be perfect to send! She received them yesterday and loved them. She said she would share the chocolate biscotti that was also in the package but the scones were all hers! These are a great breakfast on a spring or summer morning! In a small bowl, combine egg, yogurt and milk. Whisk to combine. In a large bowl, combine flour, sugar, baking powder and salt. Whisk to combine. Cut butter into flour by using a pastry cutter, two knives (or if you’re impatient like me your hands) until all pieces of butter are smaller than pea size. The flour mixture should be coarse looking. Add the strawberries into the flour mixture and toss to coat. Add the wet ingredients into the mixture and mix lightly with a fork until dough comes together. Turn dough out onto well floured work surface and pat into large ball. Cut dough ball in half. Shape half of the dough into a flat disk shape and cut into 8 slices. Repeat with other dough half and place both onto a baking sheet. Sprinkle with sugar and bake for about 25 minutes or until slightly browned. Remove from oven and let cool on baking sheet for about 10 minutes. Transfer to a wire rack and let cool completely. A few weeks ago, I saw this cake on Good Things Catered. I was awed by how beautiful it was and as I read through the recipe I thought, “huh, this is something I could make.” No crazy fondant or decorating – just simple strawberries and lady fingers. This weekend we hosted a baby shower for our friends Cristen and Graham in our home. Cristen and Graham love strawberry cake and I knew this was just the cake for the shower. I think what sold me was being able to tie the pink ribbon around it – how cute! This is kind of sad but I was looking forward to making this cake all week. I set my alarm for 7:30 on Saturday morning so I could get up and get baking! The cake was wonderful and got rave reviews – for both its appearance and taste. I will definitely be adding this cake to the “special occasion” recipes. Preheat oven to 350 degrees. Line the bottom of two 8-inch cake pans with wax or parchment paper. Grease sides of pan and flour. In a bowl, combine strawberry puree, milk, egg whites and vanilla. Whisk until combined. In the bowl of a stand mixer, add sifted flour, sugar, baking powder and salt. Mix to combine. Continue beating and add butter. Mix until mixture resembles moist crumbs. Add liquid ingredients and beat at medium speed for about 1 minute or until combined. Stop mixer and scrape down bowl. On low speed, beat for 30 more seconds. Divide batter evently among pans and smooth tops. Place pans in preheated oven and cook 25-30 minutes, until toothpick inserted in center comes out clean. Remove pans from ovent and let rest for 10 minutes. Turn out onto wire racks and let cool completely, about 2 hours. For buttercream, in a stand mixer fitted with the whisk attachment, beat butter at medium-high speed until smooth, about 20-30 seconds. Add sifted powdered sugar and salt, beat at medium-low speed until most of the sugar is moistened, about a minute. Scrape down the bowl and beat at medium spped until the mixture is fully combined, about another 15 seconds. Scrape down bowl again and add vanilla and heavy cream. Beat at medium speed until fully incorporated, about 10 seconds and then increase the speed of the mixer to medium-high and beat until light and fluffy, about 4 minutes, scraping down the bowl as necessary. To assemble cake, place first layer on a plate and top with a thin layer of buttercream, leaving about 1/4 inch border around the edges. Place a layer of sliced strawberries over the top of the buttercream layer. Place the second layer on top of the first and frost with remaining buttercream. Place lady fingers around the sides of the cake, pressing lightly to anchor. Working from the outside in, layer remaining strawberry slices in concentric cricles until you reach the middle. Place one whole strawberry in the middle. Tie a ribbon (color of your choice) around the lady fingers. And here is a picture of the sliced cake, please excuse the quality – this was the lone post-party slice that was left. It was late, I was tired and more interested in getting in bed than getting a great shot!